ecrandal: WINNERS FOR THE GIVE-AWAYS!!! So, it's the moment you have all been waiting for...our $50.00 winner for submitting a decorated cookie to us is Ruth Dunn of Ruthie's Cookies!! CONGRATULATIONS RUTH!!! Please go pick out your free cookie cutters!! And...our new blog winner for $25.00 worth of free cutters is The Fancy Lady! Congratulations to you too! Please contact us with your cutter choices!! Thank you all for the fabulous cookies that you have submitted. I still have many to showcase...so be looking for them to show up here in the next few weeks! Welcome to all of you new blog members...keep coming back for our future drawings and to view all of the wonderful cookies!! I leave you with Ruth's anchor cookie that she submitted for the drawing! She did a terrific job on it, I LOVE the rope detail! Thank you Ruth for submitting your cookie!! Hi! I'm sorry, I did not get your email. I have been having some problems with my emails lately and have not been able to figure out why some are getting through and some are not! Can you try to email me through ecrandal@aol.com? Let's see if that works. I will go and check my junk mail folders and see if it's in there. Thanks! 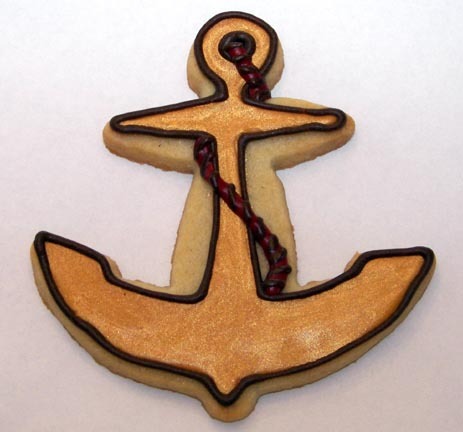 My husband would love this cookie cutter, having been in the Navy! I've become a follower here (forever, as I love both copper and cookie cutters), and "like"d your Facebook page. Hopefully, I'll win something. Keep creating! All of our cookie cutters are hand formed in solid copper with great care and attention to detail. They have a nice rolled hem and are fastened with copper rivets. We stand behind our cutters and offer a 100% satisfaction guarantee. To view and purchase our complete line of cutters please visit our website at ecrandal.com. If you are interested in having your cookie art showcased on our blog showing how you have used our ecrandal cutters please email us your photos to ecrandal@aol.com. We would be glad to post them here!